People are getting smarter about their privacy online. By now we all (hopefully) know to restrict our profiles so that only friends can see our personal information. But after 3, 4, 5+ years of social networking, how many people still know ALL of their Facebook friends? For our final project, we set out to design a fun, interactive website that would work to remind Facebook users of their overly extended networks. 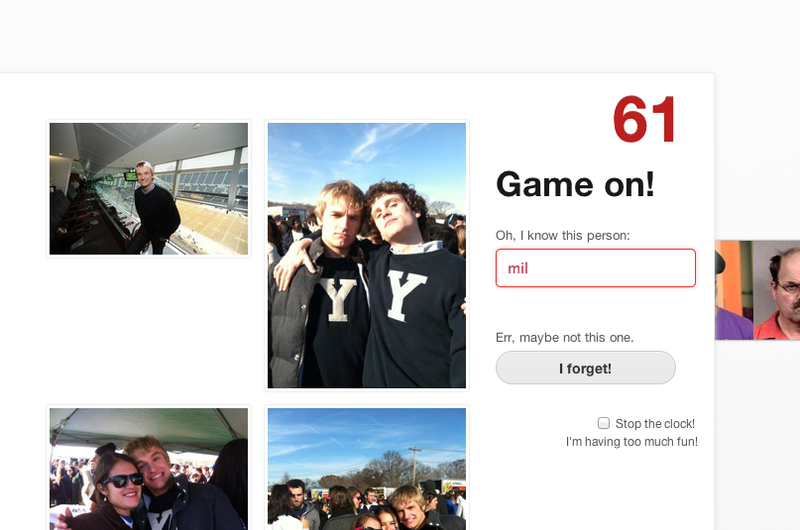 After launching this weekend, we’ve seen over 700 users (Mostly college age students) tag 35,000 friends, and it turns out that the average player only knew 70% of their Facebook friends presented. Now, of course, the term “average user” is very skewed given our user base. 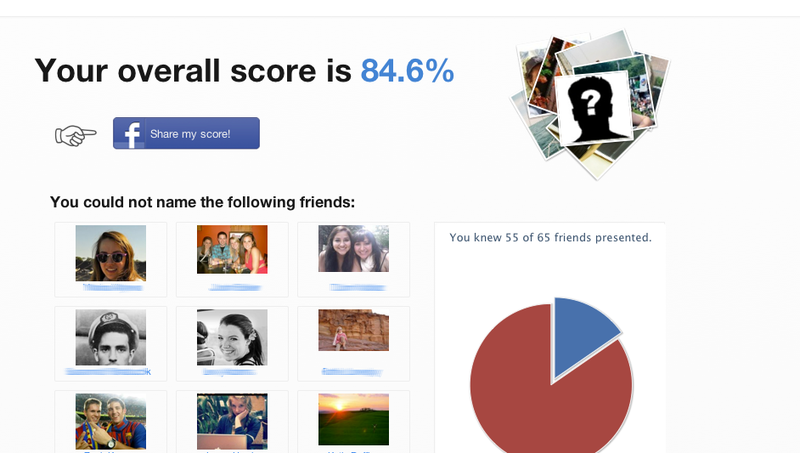 Facebook reports that the average user has 130 friends, while our average player has boasted a whopping 880. We argue that anything under 100% recognition of your “friends” should raise some privacy red flags. Every one of your friends can share your information with third-party apps (in fact it’s this that allows our app to function); we are able to pull all of your friends photos, without their permission–that is, unless they’re smart about their privacy settings. Even if you can’t bring yourself to defriend a long-lost acquaintance, at the very least you should consider creating managed friends lists with restricted privacy settings. We also hope to remind people to consider their audience when sharing content. “Friends of Friends” is never a good idea. For the average Facebook user, that’s 17 thousand people you don’t know, and why would they need to see your information anyways? Entire networks are generally a bad idea as well. You have no idea how large those networks can be, and with companies asking alums to Facebook stalk you on their behalf, does all of Yale really need to see you with your solo cups? Posted in Anonymity & Online Identity, Control, Privacy, & Technology, Cybersecurity, Final Projects, Privacy in a Web 2.0 World, Privacy: Who Can You Trust? These are some pretty surprising stats, I really like the site. How does it choose which friends to quiz you on? Is it completely randomized or does it intentionally select people you haven’t interacted with much recently? Mostly random as of right now. There’s a few deviations from randomness for the sake of speed, but at the core it’s all random.